In the late 1960’s and running through until 1979, the ILEA (Inner London Education Authority) ran and operated it’s own unique analogue cable television network. By the time of its closure it had linked together all of its 1,400 schools & colleges within the London area and also universities, including Imperial. It was Europe’s largest closed circuit television network. The system was installed and operated by the GPO Television Service, but by the time of privatisation and renaming as BT, the network was doomed, with closure looming. 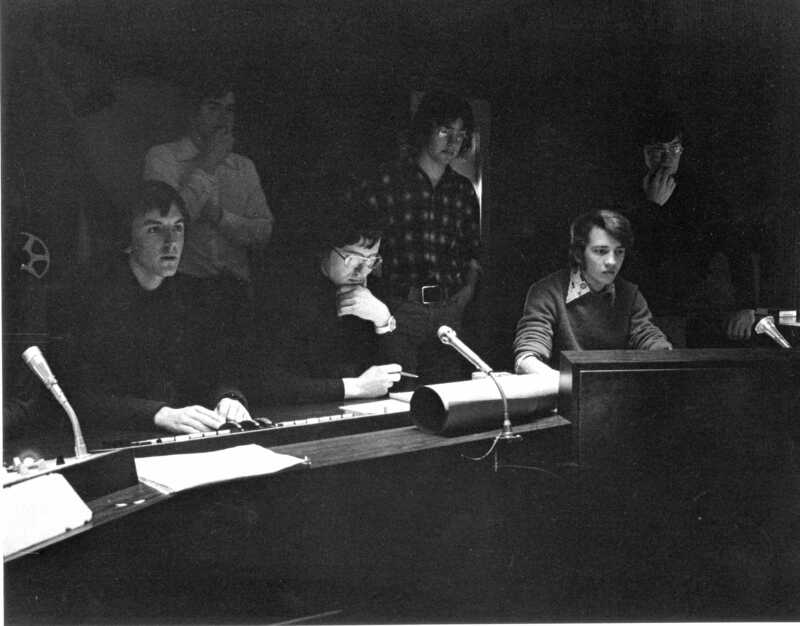 We had connection to the cable network in the early 1970’s when the University of London created and operated its own Audio Visual Centre. Programmes made by the ULAVC were recorded in their own TV studio, based at 11 Bedford Square in central London. Transmissions were all made from videotape by the ILEA TV Studio staff at the Battersea main hub. 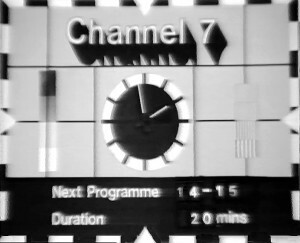 In the case of programmes made by the ULAVC a separate Channel 7 was operated for their exclusive use. ILEA’s own programmes for schools were on channels 2, 3 and 4. The ILEA studios and recordings were all to broadcast standard using 2 inch Quadraplex videotape whilst the ULAVC ran on IVC 1 inch videotape. As can be appreciated, all of the programming across the channels was therefore carried out from pre-recorded videotape. But, the network could be run live from any of the three studios at the Battersea main hub. Around 1976 I had the brainwave idea to suggest to the ULAVC that we make and provide some programmes from the Imperial studio. 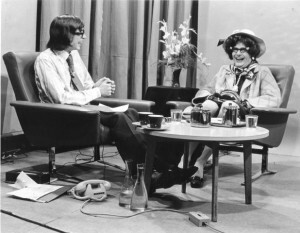 The only materials that might be of interest to other universities were perhaps some of the STOIC output which was gaining popularity with the introduction of celebrity interviews with those like film director/actor Mel Brookes and housewife-superstar Dame Edna Everage, otherwise known as actor Barry Humphries, seen in the photo on the left with Mark Caldwell in the Imperial TV studio. Several videotaped programmes were made with the specific idea of being shown on Channel 7 (Terry-Thomas was one), but I then went a step further and suggested we do something live! After I’d consulted with the ULAVC and then the ILEA Battersea operations staff we got a transmission slot and studio access. 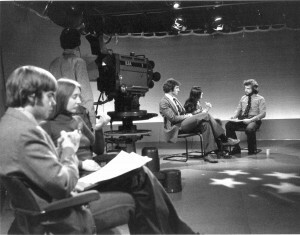 On 17 February 1977 a pilot programme called London Luncbreak went live on the air from the ILEA Battersea TV studios. 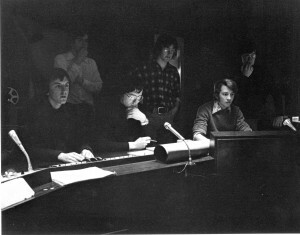 The photo on the right shows main presenter James Sinclair during the live transmission. Because of a connection I had with the then BBC “film night” TV series, I managed to get Barry Norman to the studio to take part in the live transmission. Three further programmes were produced in the ‘London Lunchbreak’ series, but our enthusiasm was dashed when we heard that the network was to close in early 1979. There was little point in continuing when the end was close. We had left it too late to get involved with the network, perhaps a couple of years earlier would have been better and given us a few more transmissions? Over on the left, in the gloom, you can see me directing one of the live programmes at the ILEA Battersea studios. The videos below are a recording of the pilot London Lunchbreak which includes a sound fault during a film clip! Remember that this programme was totally live from the ILEA studios. Also, the very last programme made and transmitted over the network by the ILEA, containing a rather large number of old programme titles (jump to the end when you get to that part). The ULAVC never made a farewell programme but continued its videotape operation, but with no cable output. ILEA continued in a similar way until, like the ULAVC, it was totally closed. Both the ULAVC and ILEA had converted into colour production by 1980, however, the now old GPO VHF cable network was only just capable of transmitting high quality colour (it was originally designed for analogue black and white in 1967). So perhaps it would have been difficult to continue with a poor technical service? However, I managed to capture a rare c1978 test transmission from ILEA in colour. It was made on Channel 2 and I was told that the ULAVC loaned ILEA a colour camera to make the live test, which seemed to work as far as I can see, that’s the last video. I appeared in three productions in 1972 and 1973, made at the Battersea studios. Two directed by Noel Hardy and one by Sandy Andrews. As you have an archive, I wondered if these productions are in it. I cannot remember the titles, but one might have been called Shove Up A Bit. One production as well as myself Jenny Donnison, starred John Salthouse, Ron Pember, and Honor Sheppherd. Another was with Adrian Shergold and myself. I would be most grateful if someone would be able to tell me if these films are available to view or purchase copies. I’m afraid we had nothing to actually do with the ILEA ETV Centre other than make a few programmes there and provide some others from our own studio at Imperial College. Remember that the channels were 1,2 and 3 for schools and 7 for universities etc and this was the channel we were involved with. However, I do know that the London Metropolitan Archives hold most if not all of the original videotapes that survived after the centre was closed. I made one visit to the ILEA Battersea studios aged 15 and it changed my life. 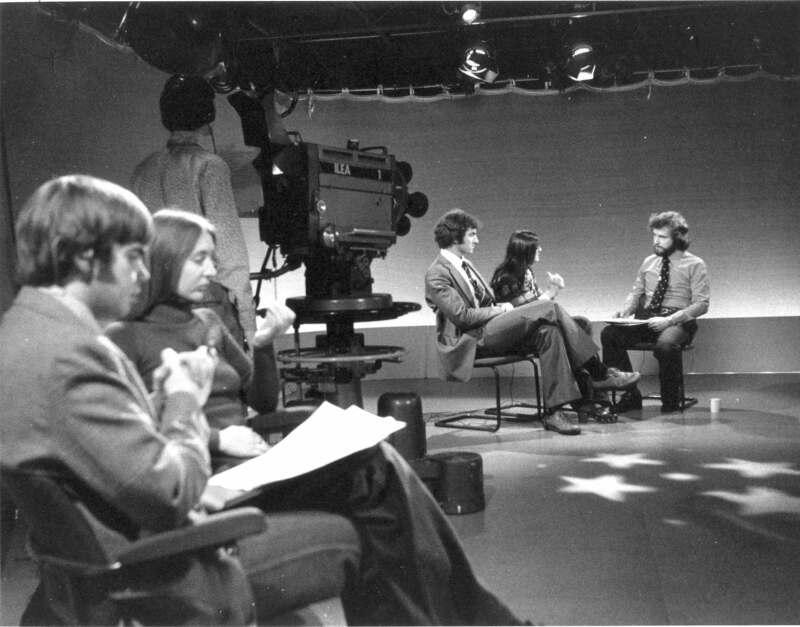 I was brought in care and I had never seen a TV studio before and loved the experience. Now aged 60 I have spent 40 years in the TV production industry and I’m currently a freelance video editor working in London. I have seen the journey from editing 2” videotapes to Avid, Adobe, Quantel and FCP. My luck changed after my visit to the ILEA studios all those years ago. Thank you – Keith. I’d like to write a paper about ULAVU service on Channel 7 which delivered Post Grad Medical Education content. Wellcome has digitised many of the videos and they are available online. There is an archive which I am going to investigate. I am interested in any reviews and evaluation. Just one minor correction that it was the ULAVC (University of London Audio-Visual Centre). I would myself be interested to discover where all the other archive videos (non medical) went to? My dad, Ron Golding used to present the ‘Creative Technology’ series. I even went to a couple of recordings and got a day off of school. After the service ended all of the programmes were offer to schools on VHS and he did show me some of them that his school had. So the big question is how do I get hold of copies now? 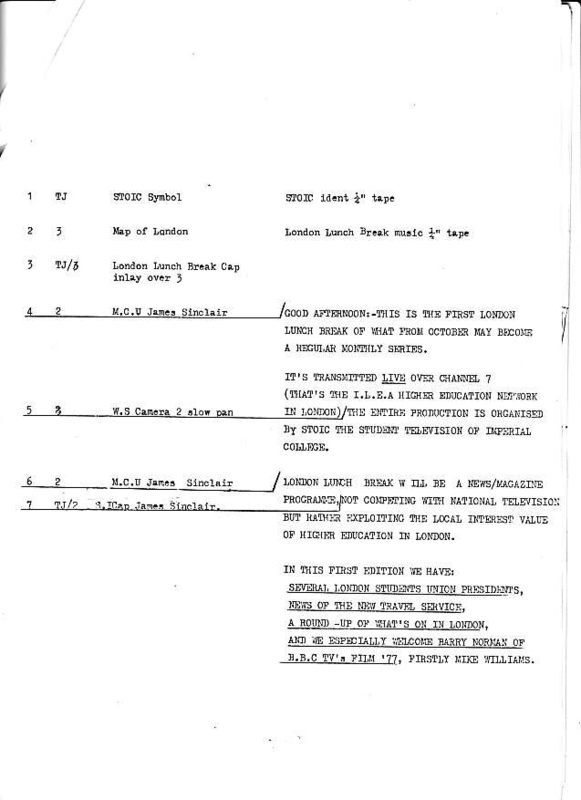 Some of the master videotapes appear to have been stored with the London Metropolitan Archives (https://search.lma.gov.uk) that’s your only hope of finding the series. Do post back any success you might have.